When Recreational Equipment Cooperative (now REI Co-op) founders Lloyd and Mary Anderson formed the nation’s first large-scale outdoor gear co-op in 1938 to share the quality equipment they were sourcing from Europe with 20 fellow climbers, they couldn’t have known then that almost 75 years later it would be the largest consumer cooperative in the U.S. Since Lloyd lived to be 98 and Mary is still alive today, they had the benefit of seeing most of REI’s growth to its current 149 stores in 36 states, with more than 12,000 employees and a membership surpassing six million people. REI was born from the Anderson’s desire to provide quality gear to fellow outdoor lovers. And whereas in recent decades REI’s private label had become more popular with family campers — although the products have won awards for sleeping bags, packs and especially tents — REI decided three years ago to completely re-vamp the co-op line and reinvent itself in direct competition to the other high-end brands on its walls. Earlier this year REI identified the separate needs of two distinct groups of hikers, backpackers and outdoor lovers. The Flash Series was developed for hikers and backpackers looking for a light and fast experience on the trail. The Traverse Series caters to those more interested in the journey than the summit. Both lines emphasize quality materials and enhanced design to address the needs of an increasingly sophisticated clientele – that’s you. The Gear Institute headed to beautiful Bryce Canyon, Utah, where we had the opportunity to discuss the philosophy and purpose behind the new Spring 2017 products with a few of REI’s product developers and managers. To prepare us for our two-day sojourn into Bryce Canyon, the media team was provided with items from the yet to be released Spring 2017 Flash Series. The gear-testing gods clearly determined this trip worthwhile, providing us with more rain, mud and wind over the 18-miles we covered during our short stay than is typical in an entire season. As a cooperative rooted in its people, REI has developed a system for using its very own “Bad Asses” – those employees who regularly go above and beyond in their roles as REI employees and ambassadors for the REI brand – to help re-engineer and design products that truly serve its membership. REI regularly invites its curated Bad Asses to share time out in the field alongside REI designers and management to better align product features with real demands of the outdoor consumer. This is in fairly stark contrast to many other manufacturers who rely on professional athletes for design input. Also during the Bryce Canyon trip, REI’s Divisional Vice President of Product Design, Nasahn Shepherd, explained that the redesign strategy for the Flash and Traverse Series was to begin with a “blank page,” considering what they wanted their products to be and offer without regard to prior designs or merely building upon older models. Nasahn says this strategy will help its in-house products reach a level of sophistication shared by its big name counterparts. The Flash 45 women’s backpack still has many of the features that helped define the Flash series – including REI’s proprietary UpLiftTM compression technology and PacknitTM suspended mesh back panel, and its 3D contoured hipbelt with sculpted foam pads that help frame the body better. Far and away my favorite feature of this pack is the water bottle pockets positioned forward for easy access. (Finally, a pack that does not require asking a trekking mate for help with water – something that never made any sense to me.) My second favorite feature was the removable top lid to help customize weight. The Flash 45-liter does not have an integrated rain cover, unfortunately, which left those of us not expecting any rain in Bryce Canyon with a big reminder as to why that little extra weight is usually well worth the effort. I did also miss the sleeping bag compartment for easier organization. As someone who rarely used trekking poles in years past, I’ve since been in way too many scenarios where I now wonder how I ever got by without them. And a pair like the Flash Carbon Poles makes carrying a pair an even bigger no-brainer; they are lightweight and very robust, a balance not all manufacturers are able to achieve. A carbon-composite construction helps them weigh in at 14.8 oz (13.2 oz for the compact set). Despite being lightweight, they are very sturdy with a comfortable EVA foam grip with ergonomic shape, exclusive to REI. Adjustments were simple with the Powerlock 3.0. In exchange for a neat and tidy package, users are required to snap into place before use the generously-sized trail baskets. The deep and heavy mud of Bryce did somehow manage to swallow my baskets and jig them loose from my poles on two occasions. That perhaps shouldn’t have been surprising given the particularly difficult terrain, although I’m looking forward to further testing to assess performance in a bushwacking scenario where heavy mud will be replaced by heavy brush. I don’t know many people who enjoy blowing up a sleeping pad, particularly in any kind of altitude. The REI Flash pad offers a weld-through construction that helped decrease the number of breaths I needed to inflate the pad. It also deflated quickly owing to its double valve construction, one for inflation and one for deflation. The pad also features a proprietary Mylar® reflective layer with die-cut insulation to increase stability and warmth to weight ratio. Another common disadvantage of insulated pads is the loud crunching they make; a big group of backpackers using air pads can make for a very noisy evening. The REI team described the design features that minimized crunching and, since this is one thing I hate about sleeping pads, I am looking forward to further testing and direct comparisons to some of my other frequently used sleeping pads to better compare and assess noise levels. For those who prefer or need greater size, the pad will come in regular and long heights, as well as regular and wide widths. The women’s Magma features a gorgeous 850 down fill that on a damp and blustery night in Bryce Canyon proved thoroughly warm and cozy. The women-specific fit offers just enough extra room in the foot, knee and hip area for added comfort while avoiding cold spots from excessive dead space. REI has opted for a very robust, U-shaped neck baffle that is not stitched fully across the top of the bag and frames the neck area to reduce draft through the head area. All in all, we’re looking forward to more extensive testing for what promises to be a well-performing sleeping bag. Although REI’s tents have evolved dramatically over recent decades especially, REI hasn’t rested – and long gone are the days of the 1940s when founders Lloyd and Mary Anderson weatherproofed their co-op mountain tents by coating them with architect’s lacquer. Key upgrades for the 2017 1-, 2- and 3-person quarter dome tents are a more efficient use of space, including usable floor and head space, a wider “narrower end” for more comfortable head-to-toe sleep arrangements, and more room in the vestibules, a full overhead bug screen to enjoy the night scene when the fly isn’t required, reversed fly doors to prevent water from spilling into the tent, and reflective guy lines. While some of the 2017 improvements might be considered catch-ups to other backpacking tents on the market, they are significant and welcome improvements. REI didn’t like that conventional hammock sleepers were crunched into tacos, so it created the Quarter Dome Air Hammock with tension lines to create a more stable and wide-open structure in which to sleep more comfortably. It features a removable rainfly and attachment lines outfitted with an aluminum hook, as well as a canopy with bug-stopping mesh. The hammock can be flipped over to hide the mesh and sleep net-free if the environment suits. The Air Hammock is strong and sturdy, with Dacron anchor lines and wire gate biners (sister clips will come later) for lightweight yet robust connection between the hammock and strap kit. Four loops at the ceiling ridgeline offer storage options as do interior and exterior pockets. 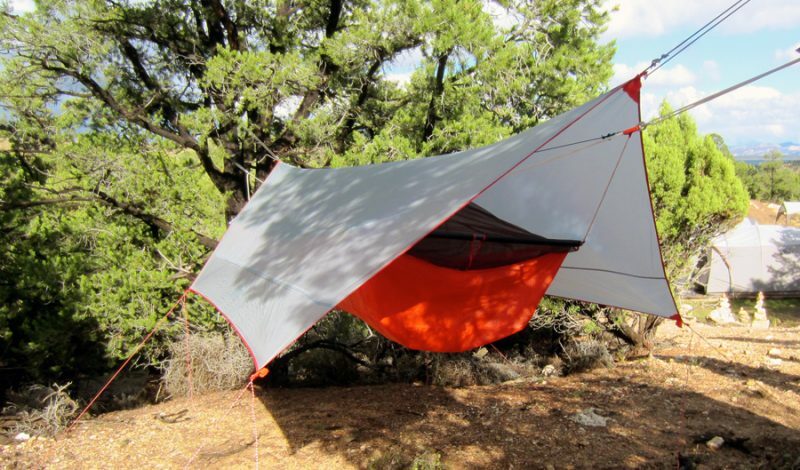 With all these features and at 3 pounds, 2 ounces, REI has created a tent alternative for those looking for another lightweight option and we are looking forward to further field-testing on this unique structure. As far as synthetic pieces go, the Activator SI shows great promise for warmth, durability and comfort. It uses PrimaLoft® insulation body-mapped for more efficient warmth and also sheds moisture in a more technical layer. The 4-way stretch and gusseted underarms made it extremely flexible and will be a practical choice for most cold-weather activities, especially since it is also water-repellant. The jacket is quilted through to the interior to improve durability and its hand pockets placed for hip-belt compatibility. The women’s Activator comes in four colors including “Beach Glass,” a pale green outer shell with an orange lining. (It stands out – a friend who was borrowing it during a recent outdoor event in Northwest Arkansas found it extremely attractive, comfortable and warm; she is anxiously waiting its release next Spring.) The color selection is a great example of REI’s move away from gender specific colors while at the same time avoiding conventional hiking and backpacking colors (at least as far as the North American market goes; our European counterparts have always managed to do a better job of incorporating color into both men’s and women’s lines). Ultimately, I suspect REI’s move towards unisex coloring will improve color choices for both men and women. It’s hard not to love a lightweight down jacket – especially when it has an excellent warmth to weight ratio, which I reflected on as I sat under a damp tarp with rain continuing to pour at the end of a wet and sweaty day of hiking in Bryce Canyon, realizing that I probably should have been more chilled than I was in only a lightweight base layer and the new Magma (and a fire that no one wanted to start). The tapered fit is accompanied by more tightly sewn baffles alongside both sides of the jacket and V-shaped baffles elsewhere, producing a highly attractive jacket. “A wilderness spirit born in 1938” is printed just beneath the logo on this lightweight fleece. It was designed as a midlayer piece but is so lightweight with excellent moisture-wicking functionality that it can easily be worn as a base layer (which is how I used it in Bryce Canyon). It was very warm on its own, but wearing it over a lighter base layer would provide even better lightweight warmth for cold-weather activities. The 9% spandex and underarm gussets gave it plenty of stretch for comfortable all-day wear. New to the 2017 Screeline HE are the thumb loops cut on a horizontal bias, meaning I didn’t even notice them at first and contacted REI about the “error” in their specs. The joy of having functional thumb loops got me over that embarrassment pretty quickly. In addition to the muted red color called “wild rouge,” it will be offered in two additional colors, black and mineral water. The textured Polartec Power Grid fabric and abrasion-resistant shoulder panels increase durability. An additional note on REI’s women’s merino midweight half-way zip base layer. Despite the market saturation of Merino base layers (or because of it), it is still very much a pleasure finding one that I don’t want to rip off with discomfort at the end of a hiking day. REI’s efforts at sourcing just the right merino wool have paid off and result in a soft and truly no-itch base layer. The superbly tailored fit made for better moisture wicking and the undearm gussets also add flexibility for easy movement throughout the day. Our wet and cold trip to Bryce Canyon also made for a good reminder as to why merino is such a wise choice for cold-weather activities. I have noticed some slight pilling after wearing and washing it a few more times, which to some degree is normal.